Construction in an urban environment is always a challenge. Space is at a premium when your neighbors are stacked right on top of you. Regulations are in place, such as noise ordinances, that limit the amount of disruption you cause in the area around you. The challenges can seem endless when you are building in the hustle and bustle of a booming metropolis. But, there is an alternative to this disruption – what if you built the structure inside a factory, away from the job site, with precision craftsmanship, where you don’t have to worry about the normal challenges a traditional construction job entails (e.g. weather delays, multiple trades on the job site, inconsistencies in quality, etc.)? 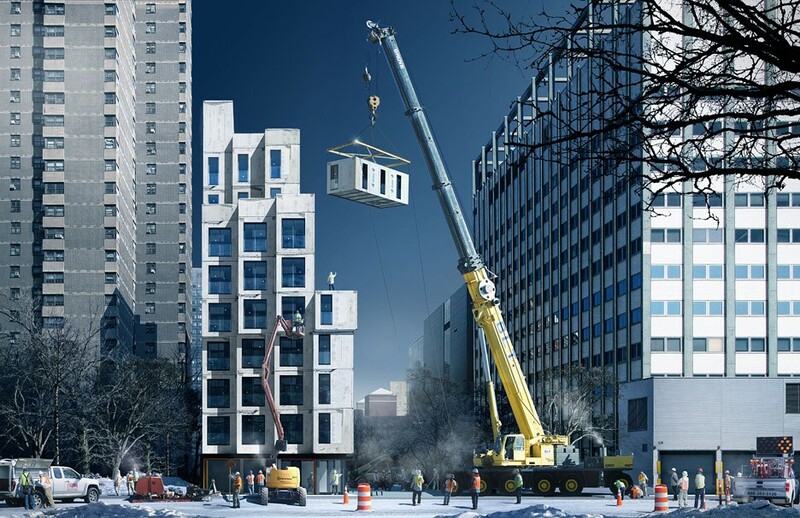 The answer to solving the building problem in urban areas is modular construction – here’s why. Time and time again modular construction has proven to be the quickest building technique in the industry today. Anyone in the construction industry knows that time is money, and modular construction is by far the most efficient technique. Modular construction can reduce build time by as much as 50%! Because the onsite build time is reduced so significantly, contractors will spend much less money on equipment rentals such as cranes to move the modules into place. The longer the onsite build time, the more money is spent on equipment and labor. In big cities like New York, Los Angeles or Chicago, space is extremely limited making it very difficult to maneuver and store material. Because 95% of the construction takes place inside a controlled factory environment, excess materials are no longer needed to be kept at the build site allowing for a much cleaner and smaller job site. We all have had to endure the not so pleasant effects of construction such as noise, increased traffic, and pollution. With modular construction, we no longer have to endure these issues for as long due to the significantly shorter build time. Less site preparation is needed as the modules arrive entirely constructed and fabricated. Rather than disrupting traffic for weeks or even months with traditional construction, modular construction allows for a much quicker build, sometimes even in a matter of days depending on the size of the project. The bulk of modular construction takes place in a factory environment, where several quality-assurance programs are in place that assure each module exceeds the customer’s stringent standards. If a module does not meet the standards set forth by a customer, it is corrected at the factory before it gets delivered to the job site – this isn’t possible with traditional construction. Modular buildings adhere to higher quality control standards as they are inspected inside the factory and at the job site. Traditionally built buildings are only inspected once, onsite where it can be difficult (and time-consuming) to make changes. When building with traditional construction methods, multiple contractors are needed for materials, transportation, and installation. Building with Z Modular makes it eZ because one group manages your project from start to finish. You will not have to deal with variable site availability and price yield uncertainty in budgeting and project design. Z Modular features guaranteed pricing. With comprehensive models, you will know exactly what you’re paying. Do you have more questions on utilizing modular construction for your next urban project? Find out how Z Modular is The Only Way to Build® your next construction project.